This entry was posted in Blog News and tagged news on March 23, 2015 by Sean Rahui. 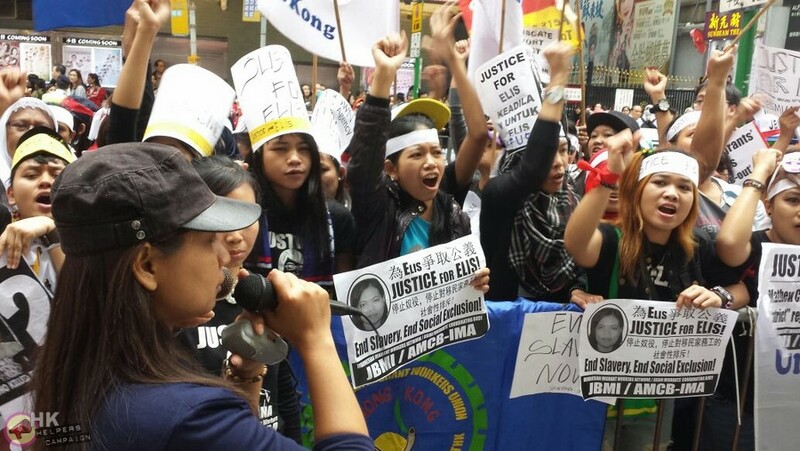 Dressed in black and wearing headbands, up to 300 domestic workers protested outside the Indonesian Consulate in Causeway Bay demanding Justice for Elis. Elis, a domestic worker from Indonesia, died tragically after a 60kg concrete block fell on her at the Sunlight Agency hostel where she was staying. They demanded changes to the Indonesian Government rules that require all domestic workers to be employed through agencies. This, they say allows for exploitation of domestic workers as the agencies are often unregulated, or regulations are unenforced. This entry was posted in News and tagged news on March 20, 2015 by Tom Grundy. 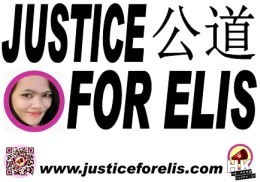 The JusticeForElis.com campaign has so far raised over HK$20,000 for Elis Kurniasih’s family. Elis, a domestic worker, died after being crushed by a concrete blog at her agency accommodation. Mission for Migrant Workers reported that her family was under pressure from the agency and Indonesian authorities to ‘settle’ rather than pursue legal action against those responsible. The final amount will be sent to Elis’s mother in Indonesia next Tuesday. If a transfer proves difficult, a member of the Mission for Migrant Workers team who is due to visit the family soon will pass on the donations in person. Elis’s body will be repatriated next Thursday. Elis was divorced and leaves behind two children and elderly parents, whom she was supporting in Hong Kong. Mission for Migrant Workers & HK Helpers Campaign would like to extend a big thank you to all who kindly donated. A rally will be held this Sunday, March 22nd at 3pm, beginning at the Indonesian Consulate in Causeway Bay. The dress code is all black in honour of Elis. This entry was posted in News and tagged news on March 17, 2015 by Meredith. 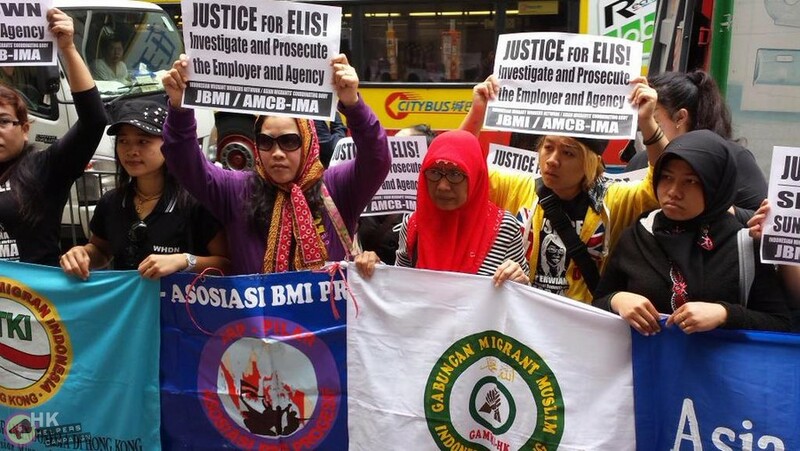 Following the death of Elis Kurniasih, 33-year-old mother of two from Indonesia, activists called for immediate action outside of the Sunlight Employment Agency in North Point midday Tuesday. “This is a murder,” said Eni Lestari, who heads the Asian Migrants Coordinating Body. She told the crowd that Elis had been charged two months of her salary to change employers in Hong Kong, and that her death was not a normal accident, but the result of human neglect. Elis was residing at the agency because her employer had decided not to hire her for another two months. This entry was posted in News and tagged news on March 2, 2015 by Meredith. For most people, work ends after they leave the office, cram into the MTR to head home or to meet friends or family for dinner. For Hong Kong’s domestic workers, reprieve from work happens only on Sundays, when the women have 24 hours each week to be themselves. For most women, this involves relaxing, running errands, or chatting with friends in the park. 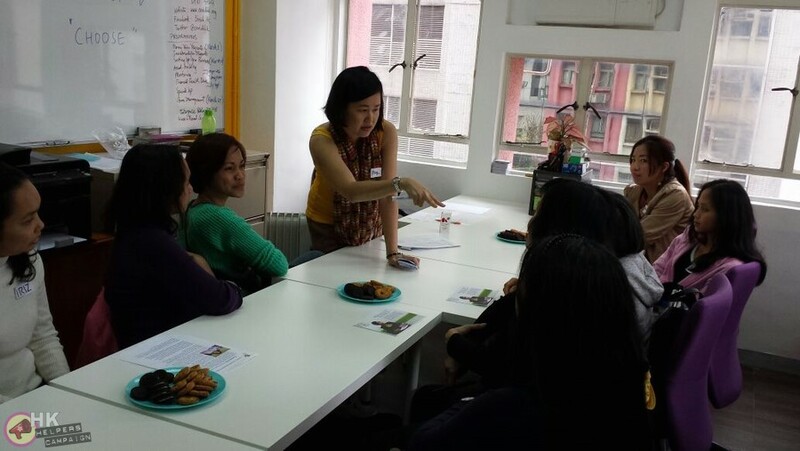 Most people would not choose to spend four hours of their sole day off in a one-room office in Sheung Wan learning how to budget and plan their finances. Yet that is exactly what dozens of women who attend Enrich’s financial literacy programs do. This particular Sunday, the women are attending a basic financial literacy course, which promises to teach the women the necessities of saving and making smart decisions with their money. Enrich offers several programs, including business development, assertive communication, and asset building – to huge success. Of their participants, 93% express greater confidence in managing debt and 100% say they are in a better financial position than before the course.